Are you between the Age of 18 and 35? Be Part of KTH 2019 Delegation. Click here and join the life-changing Journey! a life changing experience I would not forget. Once Palestine enters your heart, you’ll never let it leave.” – Sumaia E.
I saw that there is so much more to Palestine than meets the eye. I learned that Palestine is a diverse land full of people of all backgrounds and that inspired me to one day come back and connect more with my people and land.” – Danna Q. 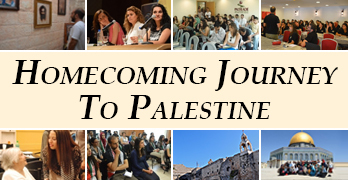 “Palestine was a rollercoaster of emotions! From visiting beautiful cities and villages, to learning about the occupation and listening to firsthand accounts of those who experience it every day, to sharing meals with new friends and enjoying the wonders of Palestinian hospitality, this journey was perfect. I will be back! !” – Stephanie Z. This trip gave me more experience than I could have ever acquired watch videos online at home, it developed in me a deep love for my father’s homeland and the people I met there.” – Jano F.
that I am from Palestine.” – Nadia S.
I am Chilean, but my blood and heart are Palestinian.” – Yasmine A. “Our culture is our home. That is what I discovered here.” – Yousef B. Are you between the Age of 18 and 35? Click here and join the life-changing Journey! We are all Palestine, wherever we are, regardless how far.